The new Pokemon game is here! The new Pokemon game is here! Eeeee! Sorry, sorry. I know I should be more professional, but every time a new Pokemon comes out I’m eight years old again and playing my friend’s Gameboy for the first time. At this point, people my age have either outgrown it and moved on, or would happily buy a broken box filled with rocks if Nintendo slapped a Pokemon label on it and released it in stores. And I … would still choose the fire-type for my starter (and probably name it Rocky. Pyrocky? Charcoal? Hmm …). The latest games in this long-running series are Pokemon Omega Ruby and Pokemon Alpha Sapphire, remakes of Pokemon Ruby and Sapphire, which were released in 2002 for the Gameboy Advance. Wait, all this fuss is happening over a remake? Yes, but here’s why I’m so excited: I lost all of my Gameboy Advance games last year in a yard sale-related incident, including my beloved copy of Pokemon Sapphire. With Omega Ruby, I can now revisit the game I loved with greatly improved graphics and features, and I don’t need to hunt down a 12-year-old game and a console to play it on. OK, so I got Omega Ruby on launch day (November 21) and spent the next few days slowly settling back into the Hoenn region. With about 15-ish hours of gameplay under my belt, I’m ready to sit back and talk about what’s changed and what hasn’t. The basic premise is the same as Ruby and Sapphire: you play as a young boy or girl who has just moved to the Hoenn region. After receiving a Pokemon from the town’s professor, you set off on a quest to reach the fabled Pokemon League, where you stand a chance of becoming the most powerful trainer in Hoenn. Along the way, you encounter all sorts of new Pokemon and people, defeat the powerful Gym Leaders of the region, foil the plans of an eco-terrorist group bent on shaping the world to their whim, and save Hoenn from a rampaging monster that has awoken from its thousand-year slumber. You know, the usual Pokemon trainer stuff. Yeah, I remember people complaining how ridiculous the plot was back when Ruby and Sapphire first came out. I mean, remember good old Red and Blue versions, where all you did was just single-handedly take down a criminal organization? Man, I miss those days. But you don’t care about the plot. Nobody cares about the plot. Let’s move on. The Gameboy Advance’s graphical capacity allowed for a Pokemon game more detailed, more vibrant, and more realistic than ever before. 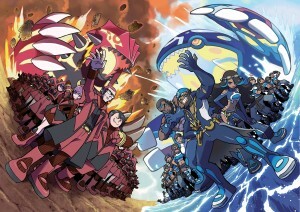 Hoenn teemed with color and life. You could see your reflection in the water, watch the wind rustle the grass, and hear the cries of Pokemon as you rode along on your bike. 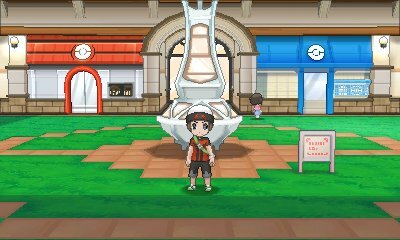 Now, all that is par the course for a Pokemon game, so all Omega Ruby and Alpha Sapphire (hereby shortened to ORAS) have now is Hoenn’s natural beauty and a completely revamped 3D environment. The latter already blew our minds last year in Pokemon X and Y, so… thankfully, Hoenn is really dang pretty. At its core, ORAS looks and plays pretty much exactly like X and Y. Pokemon-Amie, PSS, and Super Training are back, entirely unchanged, and the Fairy-type and Mega Evolutions have been retconned in, so keep in the back of your mind that some of your old strategies might not work. A few more bottom-screen features have been added with the Pokenav Plus: a map which lets you keep track of berries, battle-ready trainers and Secret Bases; a “BuzzNav” which is a portable version of the TVs from Ruby and Sapphire, but scrolls distractingly across the bottom screen when you have it selected; and my favorite so far, the DexNav. This lets you sneak up on rare Pokemon hiding in the tall grass and catch them by surprise. The more you search for a Pokemon, the better the DexNav gets at finding it, and it will eventually let you find Pokemon with rare moves and items. But forget about these new things for a minute. The Pokemon Contests are back! Yep. Forget those wimpy Sinnoh contests, or even the (gag) Pokemon Musicals– the Pokemon Contests are back, in their original form. Raise your Pokemon’s contest stats using Pokeblocks, throw them on stage, and plan what moves they use to win. I am prepared to waste many hours in Lilycove City using Earthquake on nothing, just like the old days. You may have also noticed I mentioned Secret Bases before– yep, they’re back too, but they’re not the same. They’re even better. 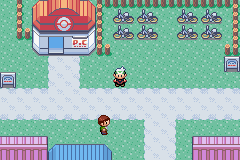 With PSS, you can visit Secret Bases from all over the world, collect their flags for prizes, and battle the trainers inside.. You can even decorate your base to be a miniature Gym, with you as the Gym Leader (AKA everything we’ve wanted for the past 15 years or so). There’s even more stuff, including being able to fly on Mega Latios and find legendary Pokemon in the clouds or something, but I haven’t gotten all that far yet. Right now I’m perfectly happy with all of the improvements Nintendo has made. Surprisingly, my only downsides with ORAS are the same downsides I had with the original Ruby and Sapphire: Rock Smash and Dive as HMs, two completely uninteresting rivals, and a dearth of decent Fire-type Pokemon in the main story. I was so desperate that I tried to train a Slugma at one point. A Slugma! As I type this I’ve just defeated Norman (thanks to my beautiful Gardevior I caught through DexNav), which marks the turning point in my journey across Hoenn. I’m trying out all sorts of new Pokemon for my team, and having a lot of fun so far! Some people say that the Pokemon series is just the same game over and over again. They’re right. But it’s the kind of game that you can play over and over again without getting bored, and that’s why I stay with it.